Better start ordering because the prices for a few of the most common accessories for the Xbox One have been revealed. Any additional controllers you purchase will be priced at $60 and the headset will be priced at $25. You have the option to buy a Play-and-Charge kit for $25 individually or you can bundle it with the controller for $75. Current Playstation Network IDs that currently exist will carry over to the Playstation 4 which makes the system even more convenient. 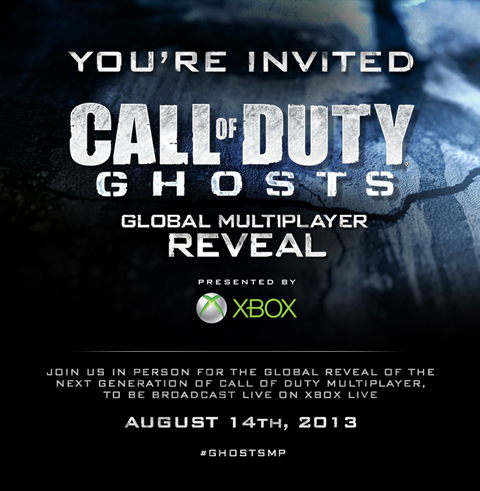 Mark your calendar, the reveal of Call of Duty: Ghosts multiplayer will be revealed on August 14th in Los Angeles. The event will be live streamed starting around 10:30 AM PDT on CallofDuty.com and on Xbox LIVE (so download the Live Streamer early if you have yet to download it). Be sure to tune in, world premiere announcements as well as in-depth multiplayer coverage will be expected during this event. I know what you’re thinking. This is big though. GameStop will be having three distribution events at their stores over the course of August, September and October. The Pokemon given away are the three legendary cover Pokemon of Diamond, Pearl and Platinum in shiny form. A shiny Pokemon is a regular Pokemon with an alternate color pattern. There is a 1 in 8,192 chance of finding one in a game, not to mention the legendary Pokemon only appear once. Combine those stats together and you have a better chance getting struck by lightning than to find a shiny legendary Pokemon. The event will start with Dialga on August 19th and will last for three weeks. Grab these while you can! Multiplayer for Batman: Arkham Origins has been revealed! Players will gang up 3v3v2 and have the option to play as the Joker and his gang, Bane and his gang, or Batman and Robin. The three players in each gang must win by capturing/holding a certain number of checkpoints. That’s easier said than done though, people playing as Batman and/or Robin will be lurking in the shadows ready to strike. To win as Batman and Robin you’ll have to reach certain amount of KO’s. The new game mode is coming to all platforms except the Wii U version….Sorry guys! Want more info? Click here for a hands-on review. Watch_Dogs had an impressive 90 awards and nominations this year at E3. To “thank the community” Ubisoft unveiled a new trailer. Some of the footage is old, some of it’s new (like the short glimpse of Clara Lillie). You’ll just have to watch the trailer below and see for yourself. The titles are getting better and better, the latest free game for Xbox Live Gold members this month is Crackdown. Grab it while you can and save a whopping 1,200 Microsoft Points (which converts to 15 bucks). During the second half of the month, gold members will also be able to purchase Dead Rising 2 and its Case Zero DLC for free! Irrational games has released DLC for Bioshock Infinite. The DLC, titled Clash in the Clouds, is an arena mode DLC that focuses on weapons and vigors. The maps offer four areas from the campaign, Finktown Docks, Emporia, the Boardwalk, and the Town Center. For gamers without the season pass the DLC is $5. Short but sweet deals, if you’re into GTA you might want to consider checking this out. Everything is 50% off. The SIP – Halo: Reach and Halo 4 – Team Action Sack Style Tournament had some issues during Week 4. Everything from that week has been scrapped but a bonus point will still be awarded for all participating teams. This week, a make-up round followed by the Week 5 gametype will be played to keep the contest on track. Part 1 will take place in Halo 4 with SIP Team Rockets on Ragnarok and Part 2 will feature SIP Haloball on the Haloball Court. Tagged Batman: Arkham Origins, Bioshock Infinite, Call of Duty Black Ops 2, Crackdown, Deals of the Week, Microsoft, PS4, Sony, Watch_Dogs, Xbox One.